‘Tehran’ in the local Farsi language means ‘at the foot of the slope’ which is obviously a description of the city’s location at the foot of the majestic Alborz mountains. It has been the capital of Iran for 200 years, making one of the oldest and most populous capital cities in Asia. According to geographical writings from the 10th century AD, Tehran was a small village where the people from the neighbouring town of ‘Rey’ fled to in order to avoid capture by the Mongols. The town grew steadily from then on. In the Safavid dynasty, Shah Tahmasb built up the city as an administrative center with walls, gates and large buildings. Tehran was first named as the country’s capital in 1778 by Agha Mohammed Khan, the first of the Qajar kings, and became an important military stronghold. People from surrounding towns flocked to the city, increasing its population rapidly. To cope with the influx, Nassereddin Shah built modern roads, squares and parks in the mid 1800s. The City has been increasing ever since and although most of its ancient architecture has been removed to bring in modern buildings, some archaeological sites such as Cheshme Ali Teppe, Shoghali Teppe, and the temple of Bahramgur are an interesting view of the past. 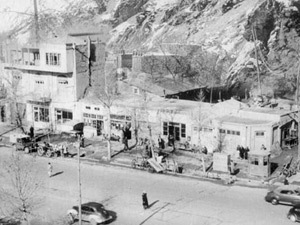 Sites of more recent historical interest include the former US embassy (now called the US Den of Espionage; )the White Palace at Sa’d Abad, where the last shah hosted the CIA’s Kermit Roosevelt as they plotted the overthrow of Prime Minister Mohammad Mossadegh; the haunting Behesht-e Zahra cemetery, where the faces of soldiers who died in the Iran–Iraq War stare out from endless fields of glass boxes; and the Azadi Tower, where hundreds of thousands of people gathered to mark the 1979 revolution.